Transparency Market Research (TMR) has published a new report titled, “Advanced Wound Care Management Market - Global Industry Analysis, Size, Share, Growth, Trends, and Forecast, 2018–2026”. According to the report, the global advanced wound care management market was valued at US$ 8.5 Bn in 2016 and is projected to expand at a CAGR of 5.8% from 2018 to 2026. Surge in incidence of chronic wounds and trauma cases is anticipated to boost the demand for advanced wound care management during the forecast period. 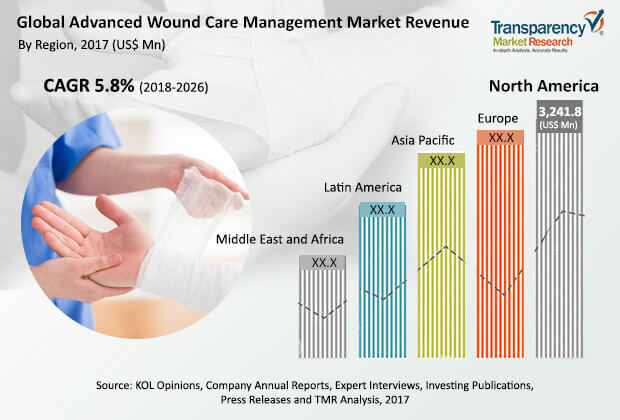 North America and Europe are projected to dominate the global advanced wound care management market owing to higher rate of adoption and awareness regarding wound care management. Asia Pacific, Latin America, and Middle East & Africa are potential markets for advanced wound care management. The market in Asia Pacific is expected to expand at a CAGR of 6.3% from 2018 to 2026. Increase in trauma and accident cases across the globe drives the advanced wound care management market. According to the World Health Organization (WHO), road accidents account for around 1.25 million deaths across the globe each year. Additionally, the number of patients with chronic wounds is rising rapidly across the world. This is likely to increase the number of surgical procedures; consequently, propelling the global advanced wound care management market. Chronic wounds is an emerging segment of the advanced wound care management market. In the chronic wounds segment, the ulcers sub-segment holds a prominent share. Venous leg ulcers account for 80% of all leg ulcers. Moreover, the chronic wounds segment is likely to hold major share due to high cost of therapy across the globe. As per a paper published by NCBI (National Center for Biotechnology Information), in May 2014, the annual burden of venous leg ulcers in the U.S. is nearly US$ 14.9 Bn, which includes indirect costs (productivity loss) as well. The diabetic foot ulcer sub-segment of the advanced wound care products market is expanding at a significant CAGR. In terms of end-user, the global advanced wound care management market has been segmented into hospitals & clinics, ambulatory surgical centers (ASCs), home health care, and others. The hospitals & clinics segment held major share of the global market in 2017. Expansion of the segment can be attributed to the availability of multiple service options and devices and tie-ups with health care companies in order to enhance health care product and service offerings. Moreover, hospitals are the preferred choice due to availability of advanced technology and better health care services. The home health care segment is expanding at a high growth rate, especially in developed economies, due to rise in geriatric population and increasing health care infrastructure and support. Moreover, rise in demand for advanced wound care management in home care settings for geriatric patients is projected to drive the segment. In terms of region, the global advanced wound care management market has been segmented into five major regions: North America, Europe, Asia Pacific, Latin America, and Middle East & Africa. North America dominated the global advanced wound care management market in 2017. The market in North America was valued at US$ 3.2 Bn in 2017 owing to a highly developed health care sector, increase in awareness among health care providers about advanced wound care management, and continuous evolution of wound care management. Advanced wound care management market offers significant growth potential in the region. The advanced wound care management market in Asia Pacific is anticipated to expand at a CAGR of 6.3% during the forecast period due to increase in awareness about advanced wound care products and expansion of the health care sector in countries such as China, Japan, and India. Moreover, technological advancements and increase in rate of adoption of advanced wound care management products are expected to propel the market in the region during the forecast period. The global advanced wound care management market is highly fragmented in terms of number of players providing different products. Key players in the global advanced wound care management market include Smith & Nephew plc, Acelity L.P., Inc., Mölnlycke Health Care AB, ConvaTec Inc., B. Braun Melsungen AG, Coloplast A/S, 3M Healthcare, Integra LifeSciences Corporation, Cardinal Health, PAUL HARTMANN AG, BSN Medical, Hollister Incorporated, Organogenesis Inc., and Medline Industries, Inc. Expansion of product portfolio through mergers and acquisitions is a key strategy followed by several global players. In December 2015, Acelity L.P., Inc. announced the acquisition of Spiracur, Inc., expanding its offering in disposable, portable, mechanical NPWT (Negative-pressure wound therapy) technology, and allowing sales and service channels to boost the expansion of the SNaP therapy system to patients and their care teams across the world who need access to NPWT devices.